Not many of us get a second chance at life. 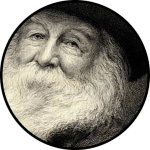 Thus it is a particularly happy task for me to introduce the second series of The Mickle Street Review, a journal first published out of Walt Whitman’s house on Mickle Street in Camden, and now revived as a project of the Walt Whitman Program in American Studies at Rutgers University in Camden. To help the journal find its new direction, I would like to review its history. MSR was the brainchild of the President of the Walt Whitman Association in 1978, Frank McQuilkin. At the time, Frank was a member of the English department at Rutgers-Camden, a poet and literary entrepreneur. He ran the annual “Walt Whitman Day” on campus and, as president of the WWA, raised money and public consciousness in support of Whitman’s house on Mickle Street, which at that time had fallen into disrepair. He persuaded me to join the WWA board of directors and help him start up a journal that would unite poets around the country in an effort to save the house, which eventually came to pass. Through an adroit use of the media, Frank moved the State of New Jersey to renovate the building next to the Whitman House, which now serves the historic site as a visitor’s center. In so doing, he preserved not only the house, but also the “street-scape” of which it is part. Hundreds of poets and readers of Whitman from around the country wrote letters in support of his campaign. So from the beginning, The Mickle Street Review was part of a broad effort to put poetry to work in the preservation of American, and specifically Camden’s, history and culture. The first issue was published in 1979 with the support of Doris Kellogg Neale, who also donated a first edition of the 1855 Leaves of Grass to the library that the WWA had begun to collect. This issue featured a transcript of a talk given by poet James Dickey in Camden, in which he described his genesis as a poet in 1942 while reading Whitman as he flew a target plane for gunnery practice in the night sky over the Atlantic, as well as testimonials by other poets of their debts to Whitman. Over the next twelve years, annual issues of MSR provided an outlet for many poets who felt some link to Whitman, and increasingly for essayists, critics, and reviewers of new books about Whitman. The presence of David S. Reynolds on the Rutgers-Camden faculty and the editorial board of MSR for several years in the late 1980s added a scholarly dimension to both “Walt Whitman Day” and the journal, with the result that Camden’s Whitman conferences began to receive scores of registrants and the journal to be deluged with hundreds of submissions. What had begun as a small sideline had become, by 1991, a mammoth responsibility for the sole remaining editor, who decided to end the run with Issue #12, “Walt Whitman and the Visual Arts,” which was co-edited with art historian Roberta K. Tarbell and republished in 1992 by Rutgers University Press. In 1994, the best essays from the first eleven issues of MSR were republished by the University of Tennessee Press as Walt Whitman of Mickle Street. Meanwhile, the Walt Whitman Association library, augmented by the large collection of first editions of Leaves of Grass donated by Col. Richard Gimbel, was catalogued in a special issue of MSR (# 9 Part One, 1987), and included in the Rutgers University Library on-line catalogue. The addition of Americanists Carol J. Singley and Tyler B. Hoffman to the Rutgers-Camden English department in the 1990s and the hiring of poet-scholar J. T. Barbarese in 1998, whose poem “Through the Windows at Walt’s” was featured in an early issue of MSR, have now made it possible to re-invent The Mickle Street Review along new lines. MSR was never meant to be the scholarly journal of record for Whitman, a position that was always (and continues to be) held by the Walt Whitman Quarterly Review, edited by Ed Folsom. From the start, the mission of MSR was to provide common ground for poets, writers, teachers, students, and readers with an interest in Walt Whitman or the subjects that he wrote about. The second series of MSR, edited by Ty Hoffman, will be even broader in scope, seeking to initiate a dialogue among diverse speakers and audiences who might otherwise not come into contact with each other. Spinning out filaments of its own, this time through a web much wider than that available to Whitman, The Mickle Street Review will connect people who may have nothing in common except to have been, at some point, lifted out of themselves by Whitman’s overwhelming power. To have read Whitman, even once, is to join a vast network whose members, from the least to the most famous, have much to say to each other. The mission of The Mickle Street Review is to be the medium through which that dialogue happens.